Keeping awards evening on track for Rail Media - On Event Production Co. Adding sparkle to awards ceremonies is a big part of what we do here at On Event Production Co, so we were delighted to be able to lend our expertise to support this year’s national Rail Partnership Awards. The awards brought together the biggest players in the UK’s rail supply chain to celebrate the very best of the industry’s achievements over the past 12 months. Delivered by Network Rail in partnership with Rail Media, they aimed to recognise organisations which are helping to deliver a better railway for Britain. Held at The Vox, at the NEC in Birmingham, in June, the event combined the awards ceremony with a formal dinner and networking. The event was compered by TV comedian and game show host Alexander Armstrong, of Pointless fame, while veteran announcer Alan Dedicoat, the voice of the National Lottery, provided pre-recorded voiceovers on the night. The evening also saw Network Rail’s Chief Executive Mark Carne give a keynote speech to guests. This was the first time we have worked with Rail Media and we won the pitch based on our set design, which incorporated elements of its brand into the overall design. 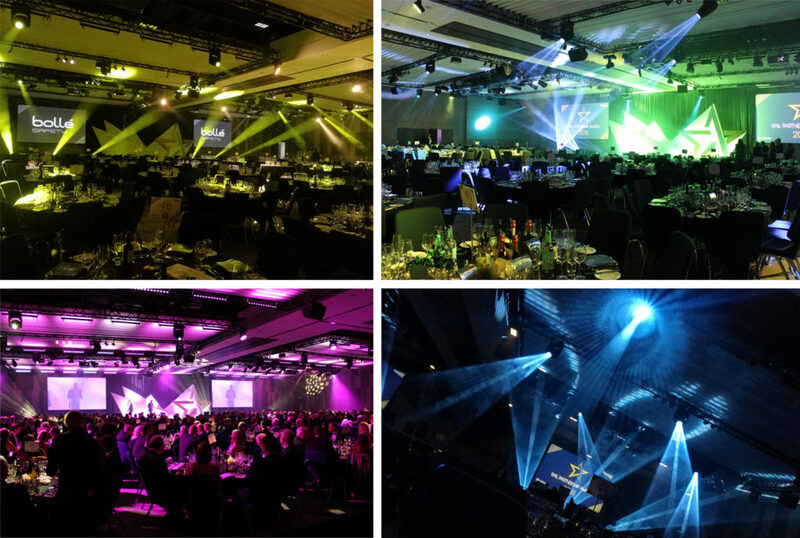 We were tasked with designing, fabricating and building the set at the venue, then providing full production on the night, which saw 14 awards being presented. Due to the limited access at the venue, our set designer had to create something that was visually interesting whilst at the same time being easy to dismantle into smaller pieces. It was then assembled and seamlessly wrapped on-site by On’s talented fabrication team. Using video content and a script provided by Rail Media, we choreographed the whole ceremony from start to finish, creating more than 30 individual audio stings, which were interspersed with Alexander Armstrong’s on-stage performance to keep the whole event running smoothly and to time. We also took both Alexander Armstrong and Mark Carne through a full production rehearsal, before the guests arrived, to make last-minute tweaks to the ceremony and identify and iron-out any potential problems. Karen Edwards, Rail Media’s senior events manager, said: “A big thank you for all of your help and support with the Rail Partnership Awards. The room looked amazing – the design of the stage was totally in keeping with the logo, and the client loved it. “Thank you for your professionalism with the run-throughs, the changes, the videos and generally anything else that came your way, it was fab to work with you all.